Thank you for participating in the Chakra Workshop. I really hope that you got a lot out of it. I'd love to know if you made it to this page and have seen the extras. Please pop a comment below and if you have any questions, feel free to add them too. Here are a few extras that can enhance the things that you learned during the Workshop. Please watch the videos as they will help to keep you on track. The videos are from The Ultimate Chakra Healing Online Course. There is also a downloadable fully guided 20 minute self chakra balance mp3 audio and printable chakra check charts available if you are interested. 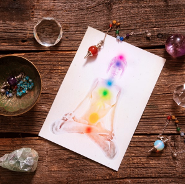 Want to take Chakra Energy Healing even further? Check out the Everything Is Connected Retreat Experience or if you're into online courses here's the Ultimate Chakra Healing Online Course. There are so many options available so please, feel free to contact Kelly for a chat and to bounce off any questions you might have. Like I said earlier,I'd love to know if you made it to this page and have seen the extras. Please pop a comment below and if you have any questions, feel free to add them too.